Academy cadet pulls man from fiery crash near Washington, D.C.
You are at:Home»Uncategorized»Academy cadet pulls man from fiery crash near Washington, D.C.
Christopher Kirk, who will soon begin his fourth year at the Air Force Academy, helped saved a man’s life after witnessing a fiery crash near Washington, D.C.
An Air Force Academy cadet helped save a life while in Washington, D.C. for a five-week internship at the Pentagon. Early on June 9, Christopher Kirk, of Burlington, Iowa, headed back to his temporary lodging at Joint Base Anacostia-Bolling on Interstate 495 when a car flew past him at about 100 mph, according to an academy news release. Moments later, he saw a flash of yellow in the distance. The car had crashed and exploded into flames. Kirk and four other people stopped at the scene. As two of them tried to pull a victim from the car’s backseat, Kirk grabbed him under his arms and helped pull him out. A driver and front seat passenger remained inside, the story said, but the flames beat back the rescuers. Kirk focused his attention on the passenger they managed to remove from the car, giving him first aid and working to stabilize the man as he drifted in and out consciousness. The victim was later airlifted to a local hospital and is expected to survive, the story said, though he suffered severe burns. “You know, you see that stuff in the movies all the time and so actually being involved was pretty foreign and surreal to me,” Kirk was quoted as saying. He said basic military training taught him how to deal with the stress of the situation and also to provide basic medical care. 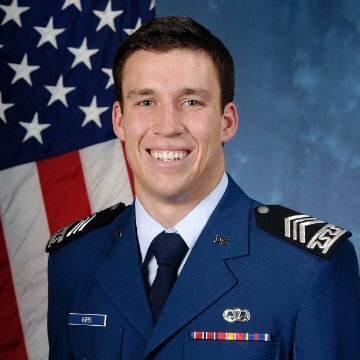 This blog shows the value of the Air Force Academy and the training involved to become an Air Force officer. C1C Kirk expedited to the accident and took the appropriate actions to reach the car victim in time. It’s reassuring to know that the SABC training and stress management, learned from the Academy, came with ease to Kirk. I commend him on his courage and professionalism.